I think my favorite part of the holiday season are the lights in the evening. It get’s dark by 5pm. The lights coming on actually gets me excited for the dark evenings. So today I thought I share some photos I took yesterday evening at Millennium Plaza Park. I also highly recommend driving about to view the neighborhoods at this time of year. 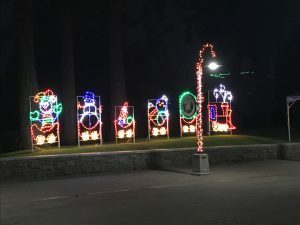 Probably the most well-known for light displays is Westlake. 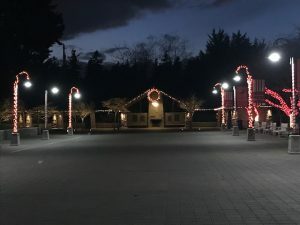 Edenberry Dr has been named by Redfin as one of the top 5 streets to view the Christmas lights in the Portland area. Then there is First Addition. 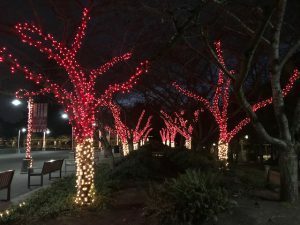 The City of Lake Oswego is holding a light contest this year. Homes will be judged this evening starting at 5pm. They are giving a special medallion and a $75 gift certificate to the winning home. I’m also enamored with the variety of lights that are now available. From the old-fashioned bulbs, to multi-striped icicles that flicker in a digital pattern. It’s lovely. My thanks to the home owners who make the effort. You make the short days and long nights a pleasure.